Rakusan did not include the Fan Series in his main sequence numbering. Therefore, the original number used for each of the 36 Series prints has been modified to identify the Fan Series members of its theme. The five different fan silhouette shapes have been here assigned arbitrary numbers 1 through 5. To indicate a fan design these shape designations are added to the 36 Series number separated by a hyphen. 108-5 is the Fan Series design with fan shape 5 in the 108 Goldfish and Medaka theme. Like all other designs in this series, 108-5 was only produced in a single print run, and few copies are currently documented. The individual designs in the 108 Goldfish and Medaka theme were completed in at least two stages. Three of the five fan designs (including 108-5) have seal C which indicates a carving date during the first half of 1934. However, the other two fan designs and the 36 Series design 108 all have seal B which indicates a later carving period closer to the time of publication. The design of 108-5 simulates an entire globular glass fishbowl seen from above. The round fan shape defines the bowl and an oval line at the top shows the water surface within. 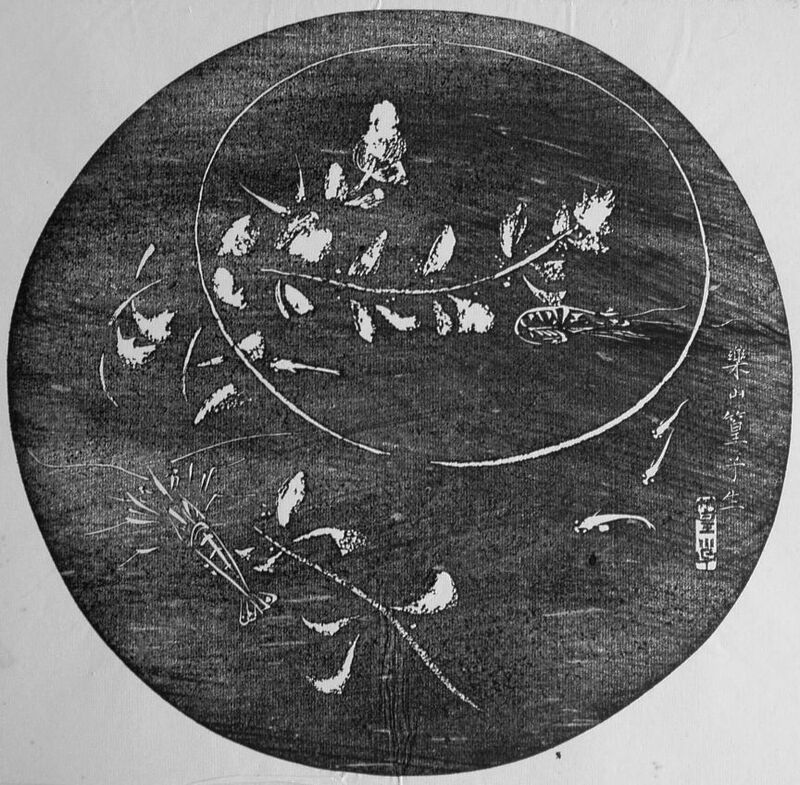 The composition includes six medaka, two small freshwater shrimp, and two sprigs of water-milfoil. The shrimp are quite sketchily rendered as line drawings, and the medaka and waterplant are essentially silhouettes. Rakusan always shows medaka as viewed from above in a conventional simplified style. 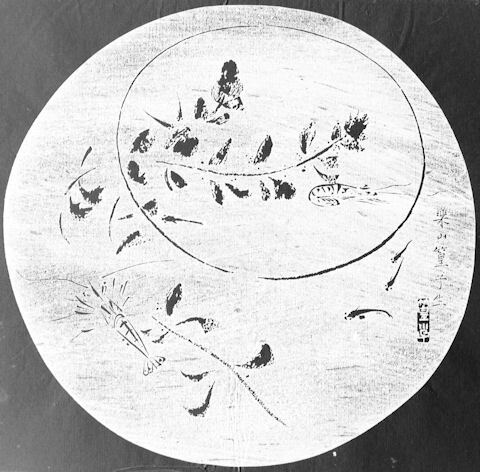 These techniques work equally well either as ishizuri or in the original sketch. Identification of the tiny shrimp in the bowl is difficult because of the sketchy way they are drawn, but their very small size suggests the freshwater shrimp genus Caridina (family Atyidae) which share the general name 沼蝦, ぬまえび, ヌマエビ, nema-ebi, lit. 'marsh/pond shrimp'. One possible candidate is Yamato shrimp, 大和沼蝦, やまとぬまえび, ヤマトヌマエビ, yamato nema-ebi. Eurasian Water-milfoil, Myriophyllum spicatum, 穂咲の総藻, ほざきのふさも, ホザキノフサモ, hozaki no fusamo, is an invasive aquatic plant commonly used in aquariums. It occurs in the background of several Rakusan aquatic designs.